Former Los Angeles Jr. King Jack St. Ivany was one of 29 players named to the preliminary roster for the 2019 U.S. National Junior Team which will represent the country at the upcoming World Junior Championship in British Columbia. Former Los Angeles Jr. King Jack St. Ivany was one of 29 players named to the preliminary roster for the 2019 U.S. National Junior Team. The group is auditioning for a spot on the final 23-player roster that will represent the United States in the 2019 International Ice Hockey Federation World Junior Championship, which will be contested from Dec. 26, 2018-Jan. 5, 2019, in Vancouver and Victoria, British Columbia. 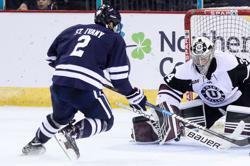 St. Ivany, a 1999-born defenseman who was selected by the Philadelphia Flyers in the fourth round of the 2018 NHL Entry Draft, is patrolling the blue line this season as a freshman at Yale University. The Manhattan Beach native has a goal and five assists in the first nine games of his NCAA Division I career with the Eastern College Athletic Conference program. The selected tournament players will convene in Everett, Wash., for training camp from Dec. 15-17. The camp will serve as part of the selection process in determining the final Team USA roster. “As a staff, we've grown more and more excited about this player pool as we've gone through evaluations this fall and we’re thrilled to have these 29 players coming to Everett next week,” said John Vanbiesbrouck, assistant executive director of hockey operations for USA Hockey and the general manager of the 2019 U.S. National Junior Team. “The player pool is deeper than it has ever been, and that’s credit to all the organizations and volunteers developing the next wave of U.S. hockey stars. Prior to Yale, St. Ivany played two seasons of junior with the United States Hockey League’s (USHL) Sioux Falls Stampede earning All-USHL Third Team recognition last season. In his final season with the Jr. Kings in 2015-16, St. Ivany helped the program’s 16U AAA team capture a Pacific District championship. That squad included 2017 NHL draft picks Cole Guttman (Tampa Bay Lightning) and Jake McGrew (San Jose Sharks).